Purchase includes the Saffiro SF5000 tire only. The wheel rim shown in the picture is not included. Picture provided is a stock picture from the manufacturer and may or may not reflect the actual product being ordered. All Saffiro SF5000 tires are continuously developing with manufactured improvements. With that said, Simple Tire and the manufacturers have the right to change these tire specifications at any time without notice or obligation. Please Note: Specifications of the Saffiro SF5000 tires shown above are listed to be as accurate as possible based on the information provided to us by Saffiro tires. cannot complain, for the price and tread life these tires are fantastic. i have a 425 whp c5 corvette and these tires handle the power great. i still have wheel spin but only if i mash the gas from a dead stop. love these tires and would buy again. By submitting a review, each person received a sweepstakes entry. Great tire and good traction even on a corvette. 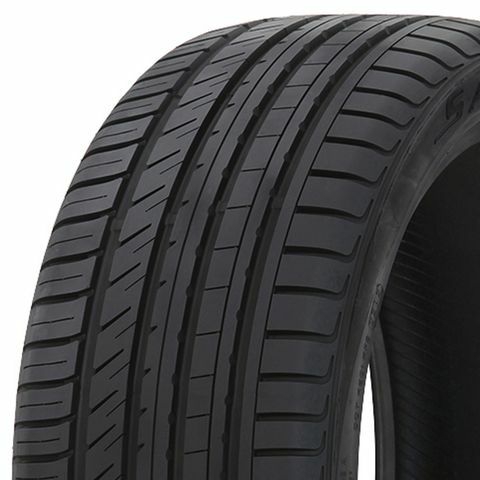 Very good tread wear and should last for years if you dont do burn outs at every red light. The Saffiro SF5000`s started off fairly quiet but have gotten rather noisy in about 2500 miles. They produce a very noticeable hum. As they are inexpensive tires I did not expect a silent ride, and I did expect them to be noisy, just not so soon. But, new tires that are noisy are better than quiet expensive tires that are dangerously worn out. As far as traction, the tires are average, which I also expected. I have not run them through snow so I cannot comment on that capacity. I would guess that they are not suitable for anything above a light snow coating. So, the Saffiro SF5000 tires are nothing special, but if you need new tires and are on a tight budget, they will get you around.